Look, everyone is into this new cool thing called fixed gears and it seems like in the past few months, we’re seeing more and more people express their love for it in various ways. Some people blog, some photograph, some videotape, some write articles, some build, some create and some market. It’s really great and we need to support this! Hell, if you have an idea, run with it! This project is the by-product of real man hours. That man is “Super” Ted James. I’ve yet to meet Ted, but one day I’d hope to. As always, I extend a welcoming hand to NYC anytime Ted! 14 Bike Co is a recently opened shop in London. Super Ted is building 14 bikes for the shops 14 riders. 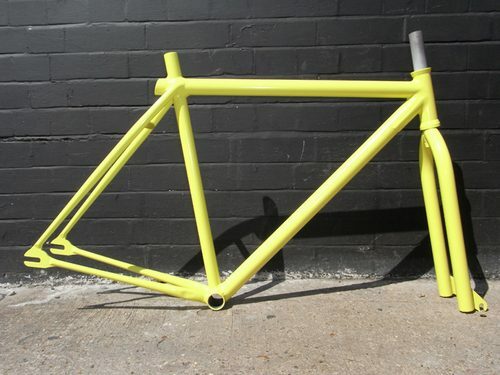 Those chain gang guys and gals are slowly receiving their frames at the mo’ [how’s that for vernacular slang?] and even though that’s not the final fork [in fact, that’s an aftermarket fork], Ted’s busy designing and cranking away at these bikes. You can see more pictures here and follow their updates here, at their blog. Ted, FGLDN and 14 Bike Co, I commend you. GREAT JOB!